I've been in Thailand nearly 9 years. I have not been back to England in all that time. Before coming here in 1999 I was traveling a lot in North, Central and South America. Was away for most of 1995 and 1996, back in Engerland in 1997, then away again for most of 1998. I think the last full year I spent at "home" was 1994. So it's not really home now. I try to keep in touch with friends who I've not seen for years. A few have been over to Thailand as have some family members. Memories do start to fade and then suddenly spring out without warning. A few days ago we were driving along and I was casually looking at the number plates on other cars. Then I was 7 years old again. 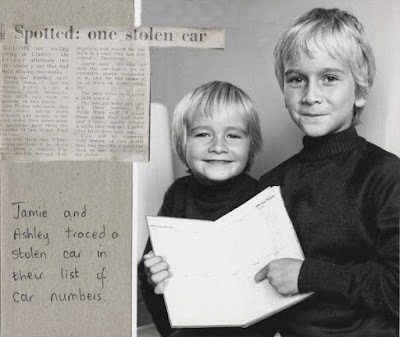 I rememebered my brother and I walking around the neighbourhood writing down car numberplates. Not sure why, but I guess we were both nerds :) One time we found a stolen car. A man who'd had his car stolen asked to see the numbers we'd written down and he found his car which had been stolen! We got our photo in the local paper. We got a reward too! My wife commented "you never told me that before". That's because I had forgotten that it ever happened. A dormant memory. My mum says she is still finding out things about my dad after more than 40 years of marriage! Mum and dad dug out an old scrapbook and sent me the photo and old newspaper clipping from more than 30 years ago. Tick. Tock.